The nation’s increasing ideological polarization makes political compromise more difficult, in part because those at opposite ends of the ideological spectrum see less benefit in meeting the other side halfway. A logical point of compromise for most Americans is splitting things down the middle. But a significant minority – and a substantial share of the active and engaged electorate – see things differently, saying their side should get more of what it wants in political negotiations. Any number between 0 and 100 was accepted as a response, with responses then collapsed into 11 categories, as illustrated here. See Q26 in the topline for these categories. However, while they may be less amenable to political compromise, people on the left and the right are not necessarily more extreme in their policy views. To be sure, many Americans who have consistently liberal or conservative views support far-reaching policies on issues like gun control, abortion, health care or immigration. But in many cases they are no more likely to express these opinions than are those who hold a mixture of conservative and liberal views. The survey includes several questions about proposals that are on the periphery of current policy debates, such as whether to launch a national effort to deport all unauthorized immigrants and whether to eliminate all restrictions on gun ownership and abortion. Sizable minorities of those who hold mixed ideological views support many of these proposals. This belies the popular conception of the center as largely made up of “moderates,” in contrast to the “extremists” on the left and right. When Americans look at the political battles between President Obama and Republicans in Congress, they tend to say both sides should meet in the middle. For roughly half of Americans (49%) the preferred outcome is to split the difference at exactly 50/50 — each getting about half of what they want. This view holds across party lines. While some Democrats would prefer to see Obama get more of what he wants in negotiations with Republicans, 46% of Democrats and Democratic-leaners say the ideal outcome is 50/50. Exactly half of Republicans and Republican-leaners agree that splitting the difference is the right end result. But those who see the world through more ideological lenses have a very different perspective. 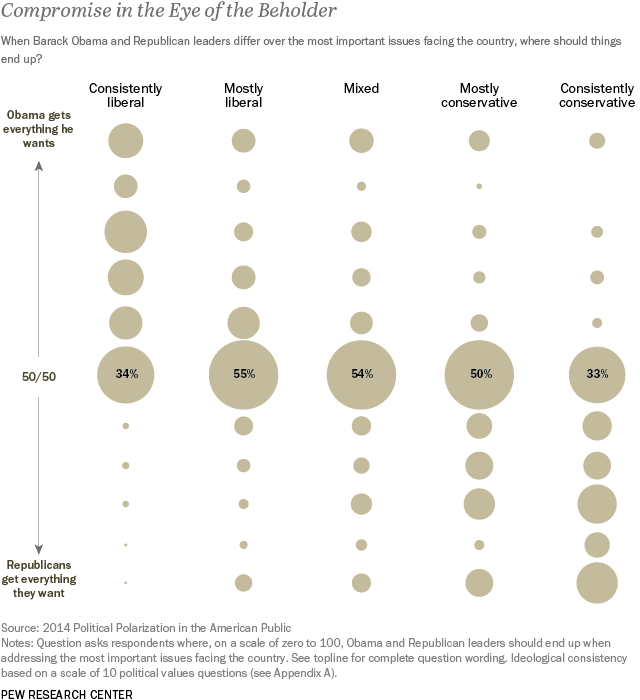 Only about a third (34%) of consistent liberals think of the ideal point as halfway between Obama and the Republicans. Instead, most (62%) think that any deal between the two sides should be closer to Obama’s position than the GOP’s position. And not by just a little bit: On average, consistent liberals say Obama should get two-thirds of what he wants, meeting congressional Republicans only one-third of the way. And 16% of consistent liberals think Obama should obtain 90% or more of what he wants in these deals. Those on the right also are reluctant to see their side give ground. On average, consistent conservatives say that ideally, congressional Republicans should get 66% of what they want, while Obama should get just 34% of what he wants. 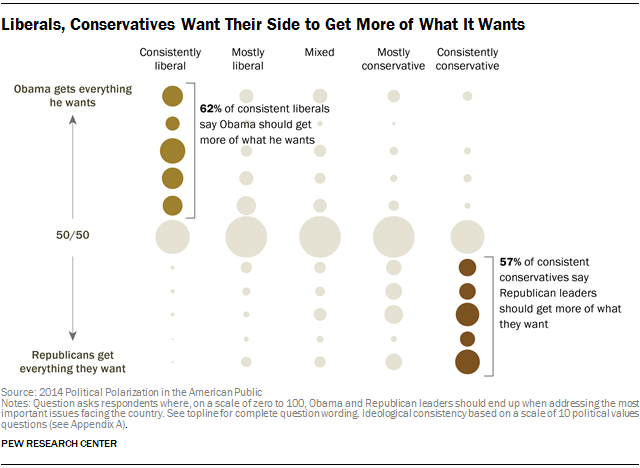 Nearly a quarter (22%) of consistent conservatives think that Republicans should get 90% or more of what they seek. 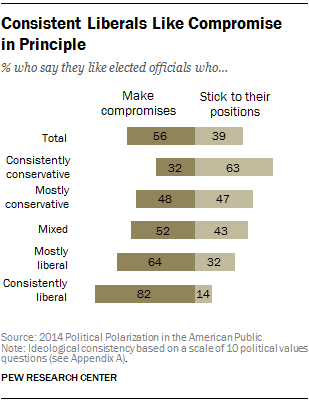 In principle, most Americans want their political leaders to compromise. A 56% majority prefers political leaders who “are willing to compromise,” while 39% prefer leaders who “stick to their positions.” And this preference has a decidedly ideological tilt: Consistent liberals overwhelmingly prefer leaders who compromise (by an 82% to 14% margin), while consistent conservatives voice a preference for leaders who stick to their positions, by a 63% to 32% margin. Despite liberals’ stated preference for compromise, however, they are about as likely as conservatives to want political agreements that favor their side. Although 82% of consistent liberals prefer leaders who compromise, 62% say the optimal deal between Obama and the GOP should be closer to what Obama wants. Among consistent conservatives, there is less of a contrast: 57% say that when Republicans and Obama need to strike a deal, Republicans should get more of what they want. That’s in line with the 63% majority who say they prefer leaders who stick to their positions. The survey includes questions on a number of current policy proposals, relating to immigration, health care, abortion, gun control and other issues. Those on both sides of these issues were asked follow-up questions intended to test how far they would go in support of a policy position. There is a tendency to assume that people at either end of the ideological scale are most likely to hold more extreme political views, yet this often is a flawed assumption. Many Americans may hold liberal or conservative values, yet do not consistently express very liberal or conservative opinions on issues. Conversely, being in the center of the ideological spectrum means only that a person has a mix of liberal and conservative values, not that they take moderate positions on all issues. This survey includes long-standing trend questions on several issues, including gun control, abortion, health care, immigration and entitlements. These measures capture attitudes about current debates, such as whether it is more important to control gun ownership or protect gun rights. But we also tested opinions about proposals that are not a focus of today’s political discussions. In the case of guns: how many Americans want to eliminate all restrictions on owning guns? Or alternatively, how many would support limiting gun ownership just to law enforcement personnel? These are not ideas that typically draw support from political leaders on the left or right. Yet opinions about far-reaching proposals are revealing. Nearly a quarter of Americans take an all-or-nothing approach to gun ownership: 11% favor no limits on gun ownership; 12% believe no one except law enforcement personnel should be able to own guns. The goal of this research is to determine the relationship between ideological consistency and opinions that, in the current political context, may seem extreme. In some cases, as with views on gun ownership, consistent conservatives are most likely to express such opinions; in others, such as in views on abortion and health care, liberals stand out. Yet on each issue tested, sizable minorities of those with mixed ideologically views express either extremely conservative or liberal opinions. The questions used for this analysis can be found in the survey topline. Take gun control as an example. In this survey, we update our long-standing trend on whether it is more important to protect gun rights or control gun ownership. Overall, 49% prioritize gun rights and 48% say it is more important to control gun ownership; these views are little changed from a year ago. And to capture more detail on how far people are willing to go on this issue, each of these groups was asked a follow-up question. Those who favor gun rights were asked if there should be some restrictions – or no restrictions – on gun ownership. Those who prioritize gun control were asked if most people should be allowed to own guns within limits, or if only law enforcement personnel should be allowed to own guns. Overall, most Americans expressed what might be considered a “moderate” view: They either prioritize gun rights but with some limits, or they prioritize gun control but support gun ownership with some limits. Smaller numbers take more unyielding positions: 11% support no restrictions on gun ownership, while about as many (12%) favor, in effect, a ban on personal gun ownership. Opinions on the threshold gun control question are deeply divided along ideological lines: 96% of consistent conservatives say it is more important to protect gun rights, while 81% of consistent liberals say it is more important to control gun ownership. Compared with this near-unanimity on general priorities, all-or-nothing proposals on guns attract relatively modest support from the right and left. Consistent conservatives are most likely to favor complete freedom to own guns. 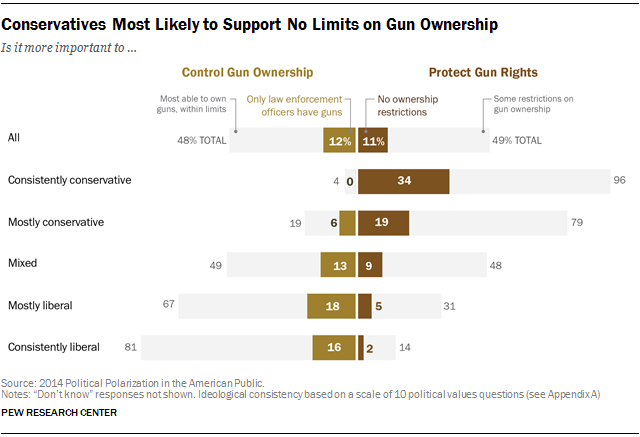 Still, that is the minority view: 60% favor gun rights but with some limits on gun ownership, while 34% say there should be no limits at all. And on the other side, just 16% of consistent liberals say that only law enforcement officials should have guns; 64% say they support gun control but that most people should still be able to own guns, within limits. Notably, about one-in-five (22%) of those with ideologically mixed views supports one of these positions. Their views are divided: 13% favor a virtual ban on people owning guns, while 9% would place no limits on gun ownership. Thus, those in the center ideologically are no less likely than those on the left, and only somewhat less likely than those on the right, to hold all-or-nothing views about gun ownership. The congressional debate on immigration reform has centered on whether a “path to citizenship” for unauthorized immigrants in the U.S. should be included in legislation. Public opinion on this issue is lopsided, with 76% saying immigrants in the U.S. illegally should be eligible for citizenship if they meet certain requirements, while just 23% are opposed. Yet the issue remains contentious, at least in part because opposition goes significantly beyond the view that unauthorized immigrants should simply be denied an opportunity to become citizens. Most of those who oppose a path to citizenship – 17% out of the 23% – say there should be a national law enforcement effort to deport all immigrants who are living in the U.S. illegally. Support for deportation of all unauthorized immigrants is relatively high among consistent conservatives, 41% of whom take this position. But it draws support elsewhere as well: 28% of mostly conservative Americans take this view, as do 19% of those who show neither a conservative nor a liberal leaning. On the other side of the issue, those who back a path to citizenship were asked if unauthorized immigrants who meet certain conditions should be eligible for citizenship right away or only after a period of time. Most Americans (54%) think eligibility should come only after a period of time, while a much smaller share (20%) believes that unauthorized immigrants who meet the requirements should be eligible for citizenship right away. 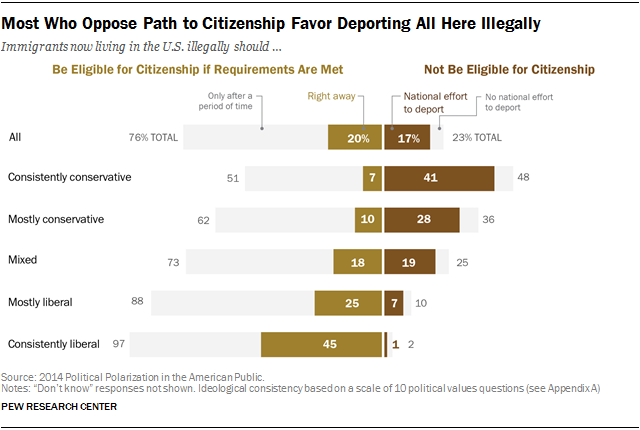 As with views of deportation, opinions about immediate eligibility are strongly associated with ideology; 45% of consistent liberals favor immediate citizenship. But many others hold this view too, including 18% of those who have virtually no ideological predisposition, and 7% of consistent conservatives. All told, 37% of non-ideological Americans support drastic changes in America’s immigration policies: 19% favor deportation of all unauthorized immigrants and 18% support immediate citizenship if conditions are met. That’s only slightly lower than the share of consistent liberals and consistent conservatives who favor such major changes (46% and 47%, respectively). Abortion remains one of the most divisive issues in American politics: The current survey finds 51% saying it should be legal in all or most cases, while 43% say it should be illegal in all or most cases, a balance of opinion little changed over the past decade or more. Yet abortion also is an issue on which the public generally supports a middle-ground approach. Most of those who support legal abortion say there should be some restrictions on abortion (31% of the public answers this way); just 19% say there should be no restrictions at all on abortion. 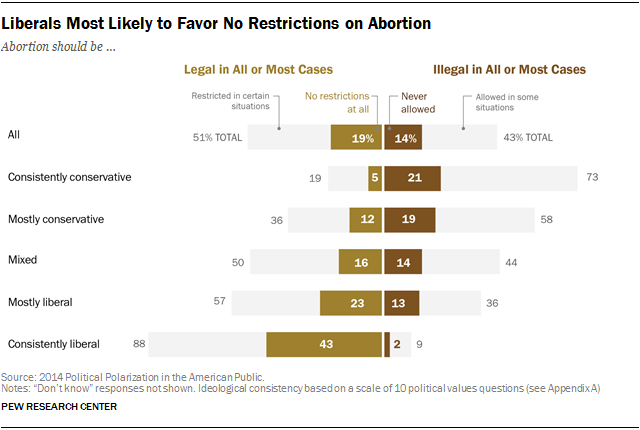 Similarly, among abortion opponents, twice as many say abortion should be allowed “in some situations” as say it should “never be allowed” (28% of the public vs. 14%). Consistent liberals are far more likely than other groups to say there should be no restrictions on abortion. In fact, those who favor legal abortion (88%) are evenly divided (44%-43%) over whether there are some situations in which abortion should be restricted or there should be no restrictions on abortion. By comparison, only about one-in-five (21%) consistent conservatives support a total ban on abortions. In part, this reflects the fact that conservatives are less likely to oppose legal abortion than liberals are to support it (73% vs. 88%). Yet even among consistent conservatives who oppose abortion, most say it should be allowed in some situations; 51% of consistent conservatives oppose abortion, but say it should be allowed in some circumstances, more than double the share who thinks it should never be permitted. While opinions about abortion are correlated with ideology, many Americans who are not ideologically aligned still express unyielding views on this issue. Among those who hold a mixture of liberal and conservative opinions, 31% see the issue in black-or-white terms (14% say it should never be allowed, 16% say it should face no restrictions at all). The government’s surveillance program is an unusual issue in that it divides members of both parties. The current survey finds that 54% of Americans disapprove of the government’s collection of telephone and internet data as part of anti-terrorism efforts, while 41% approve. But most of those who disapprove (38% of all Americans) say the National Security Agency should be allowed to collect some limited information. Similarly, most who approve of the program (26% of all Americans) think there should still be some limits on what the NSA collects. Three-quarters of consistent conservatives (75%), as well as 53% of consistent liberals, disapprove of the government’s surveillance program. Yet conservatives and liberals are not any more likely than others to view the issue of government surveillance in stark terms. Among consistent liberals, as many say the NSA program should be prevented from collecting any data about U.S. citizens as say it should be able to collect whatever it feels it needs (12% and 13%, respectively.) Nearly a quarter (24%) of consistent conservatives want to shut down the program, while 7% say it should be unfettered. And these views aren’t limited to the ideologically oriented. Those with mixed ideological views are about as likely to have a relatively sweeping preference about government surveillance: 16% say, in effect, there should be no limits on the NSA’s data-collection program; 14% think it should not be able to collect any data on U.S. citizens. The idea of a single-payer health care system – in which the government pays for all health care costs – has long been a dream of many liberals. But when Congress took up health care reform in 2009, Democrats united behind a market-based proposal – what became the Affordable Care Act – which was seen as more politically feasible. Overall, the public is divided over how far the government should go in providing health care. About half (47%) say the government has a responsibility to make sure all Americans have health care coverage, while 50% say that is not the responsibility of the federal government. Those who believe the government does have a responsibility to ensure health coverage were asked if health insurance should be provided through a mix of private insurance companies and the government, or if the government alone should provide insurance. The single-payer option was supported by 21%, while about as many (23%) favor a mix of public and private insurance. 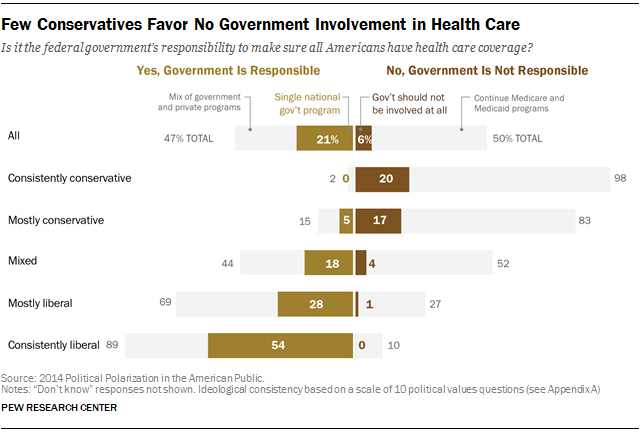 Even among consistent conservatives, there is minimal support for the government having absolutely no role in providing health care. Three-quarters of consistent conservatives (75%) say the government should continue Medicare and Medicaid while just 20% think the government should not be involved in providing health insurance. The public, particularly younger Americans, are deeply skeptical about their chances for ever receiving full Social Security benefits when they retire. Among the overall public, just 14% expect that Social Security will have sufficient resources to provide the current level of benefits; 39% say there will be enough money to provide reduced benefits and 43% think that, when they retire, the program will be unable to provide any benefits. Despite the bleak public perceptions about the future of Social Security, most Americans (67%) say that benefits cuts should not be an option when thinking about Social Security’s long-term future. Just 31% say some reductions for future retirees need to be considered. 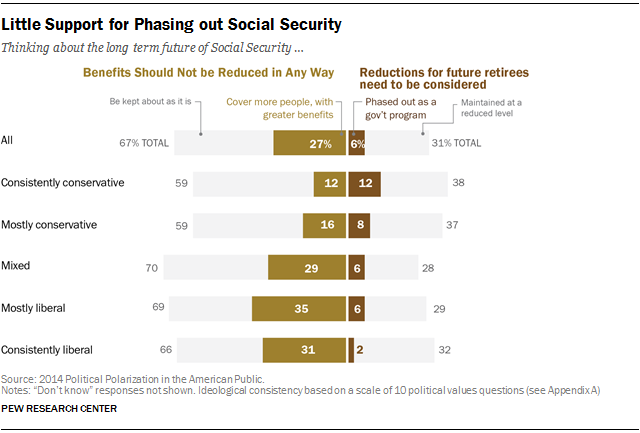 Among those who say benefits reductions should be considered, very few (just 6% of the public overall) think Social Security should be phased out as a government program. Far more (24% of the public) think benefits should be maintained but at a reduced level. There is substantial agreement across the ideological spectrum on the question of whether benefit reductions should be considered: Majorities in every group, including 59% of consistent conservatives, say they should not. Support for expanded benefits is nearly as high among those with mixed ideological views (29% favor) as it is among consistent liberals (31%). The prospect of phasing out Social Security draws little support. No more than about one-in-ten in any group favors phasing out Social Security as a government program.